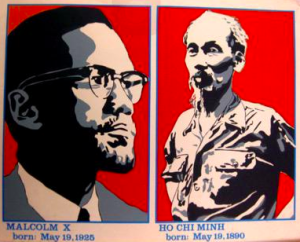 Today in history, Malcolm X and Ho Chi Minh celebrate birthdays, Martin Luther King Jr.’s Letter from a Birmingham Jail was published, and thinker, philosopher and activist C.L.R. James passed away. This is Marc Steiner, and today is May the 19th. Welcome to This Day In History. Of course that was voice of the iconic Malcolm X, whose words, ideas and leadership defined not only the 1960’s, but the nature of our social and political discourse in the 21st century. We honor Brother Malcolm on this day of his birth, he would have been 90 years old today. Before you can feel the warmth and beauty of Spring ..
And let us remember John Percial Parker, born into slavery and sold away from his family at the age of 8. He ended up buying his freedom when he was 18 years old because of his mechanical skills. He became deeply involved in the abolitionist movement and in 1854, he founded the Ripley Foundry and Machine Company in Ohio, which employed dozens of workers and lasted till 1918, well past his death. He received numerous patents for machinery and wrote a book “His Promised Land: The Autobiography of John Parker, Former Slave and Conductor on the Underground Railroad. In 1963, Martin Luther King’s groundbreaking book Letter from a Birmingham Jail was published. Martin King wrote this masterpiece while in harsh, jailed conditions. He was forced to write this political philosophical masterpiece on the margins of newspapers, scraps of paper smuggled in by lawyers, and toilet paper. This seminal work outlined the strategy of nonviolent resistance to racism, the idea that people have a moral responsibility to break unjust laws and the idea that no laws will be changed in America without direct action. He wrote “injustice anywhere is a threat to justice everywhere.” A book all should read for its relevancy to this day. You hear the name Johns Hopkins, and it conjures different things for different people. But the Quaker Johns Hopkins who wanted to educate and heal, who founded the University and Hospital that bear his name, was born today in 1795. Mustafa Kemal Ataturk, know as Ataturk, was the first President of Turkey. After the defeat of the Ottoman Empire in World War I, Ataturk transformed Turkey into a modern, secular, Westernized state. The legacy of Ataturk is still a battleground in the 21st century. T.E. Lawrence, who we know as Lawrence of Arabia, died when he crashed on his motorcycle while speeding through the English countryside. His books Seven Pillars of Wisdom and Revolt in the Desert gave voice to the aspirations of Arab people looking for their liberation from the Turks and the Western World. And in 1989, CLR James passed away. This Trinidadian thinker, philosopher and activist wrote books like The Black Jacobins, which became part of the underpinnings of the West Indian liberations and our understanding of race and class.